Need your help/advice/opinion for below sql. I try to select all count record that exist in tables between to date insert by user.Currently, just put dummy date to test. The result is ok, but it only view for match data. How to include the record that not match as long is between those two date. Suppose the record will show all record from month January to December but is only show starting with April which it only record that exist in db.I'm thinking to use JOIN to fix this, but not work.Thanks in advance. what you are doing is conventional inner join where join conditions ar in where-clause. The result set of inner join only contains rows where these join conditions (a.id_aduan=c.id_aduan AND c.id_bahagian=b.bahagian_id) be completely matched. Only outer joins (left, right, full) guarantee that rows are included in result set where join conditions are not completely matched. This doesn't affect the other predicates, e.g. AND b.nama_bahagian='Bahagian Konsular'. You should omit ASC in GROUP-BY because this clause does not have such thing. Well, you order the results alphabetically by name of month, so April, August, December ... will be the order, more common seems to be ordering by number of month. Hi tesuji, thanks for reply. I try to use outer join.but not working.i google a bit. It depends on you which sort of joins to be applied. 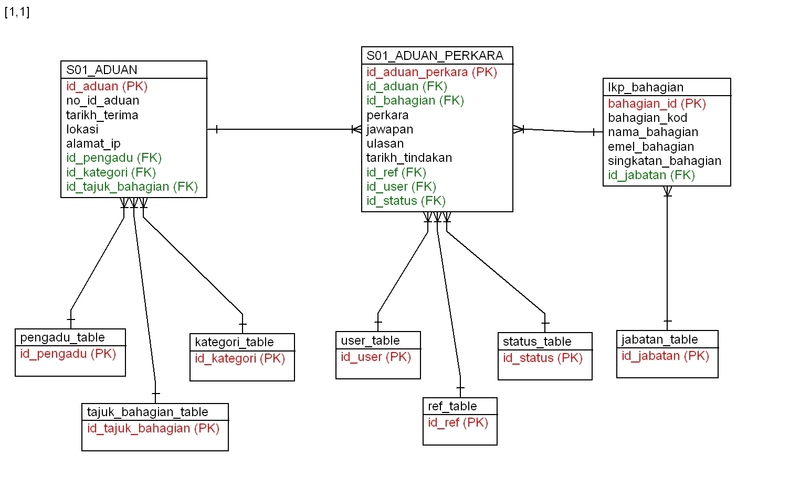 I think I can give more help if I know the create-table statements of all related tables, especially of tables s01_aduan, lkp_bahagian, s01_aduan_perkar. Your 2nd select has some more, e.g. table DUAL. For choosing the right joins it is also important that all primary and forein keys of these tables be identified. Can you post all these pieces of information? I think, now I have got a fair impression of what you are intended to do. I would suggest that you test the following query. The idea of this query is that you pre-select your data and in 2nd step this data will be further arranged to meet your spread-sheet-like chart. Tell me its result and whether it meets your concept to some degree, especially whether you are missing some pieces of necessary information. I would like to know what data is in table Kategoi (there must be such a table because id_kategori seems to be foreign key in S01_ADUAN). Please, state some data examples, say 4 to 5 rows. Attached is an ERM of your three tables generated by reengineering tool where I decided that all attributes consisting of id + table name are primary keys (red color) and all other attributes having id in their names are foreign keys (green colors), there aren't identifying relationships to the extent I see. In case of foreign keys the unknown reference tables where formally created with names derived from foreign keys. This decision was necessary because, unfortunately, there aren't any primary or foreign key constraints defined in your tables. You may correct this ERM. Well, is your database schema strictly prespecified or are there any changes possible (e.g. isam -> innodb, adding primary + foreign keys, changing DT of keys from double into int etc)?